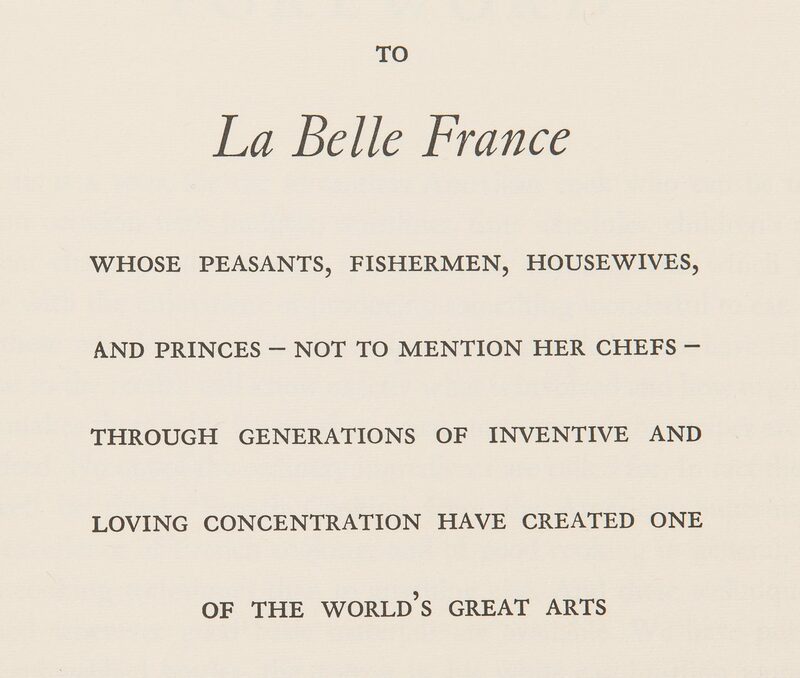 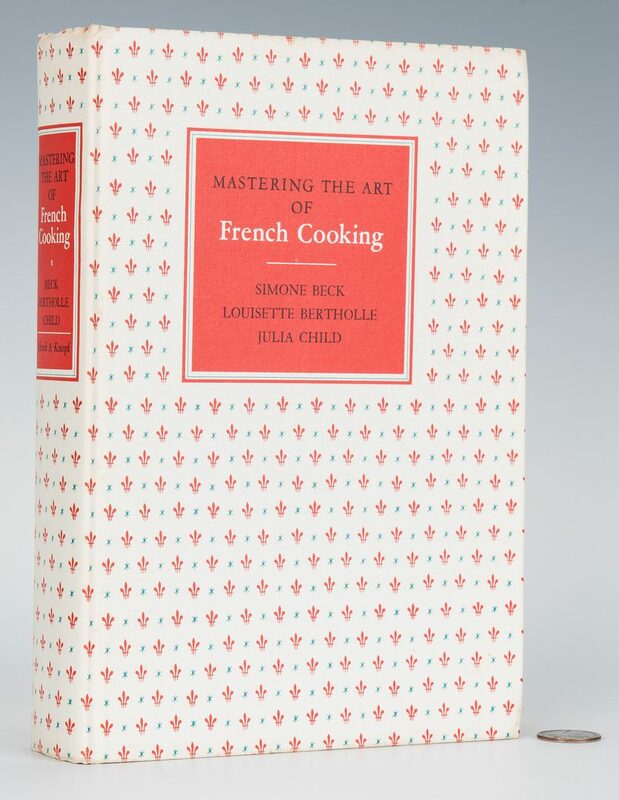 Lot 246: Mastering the Art of French Cooking, First Edition, Julia Childs, et al. 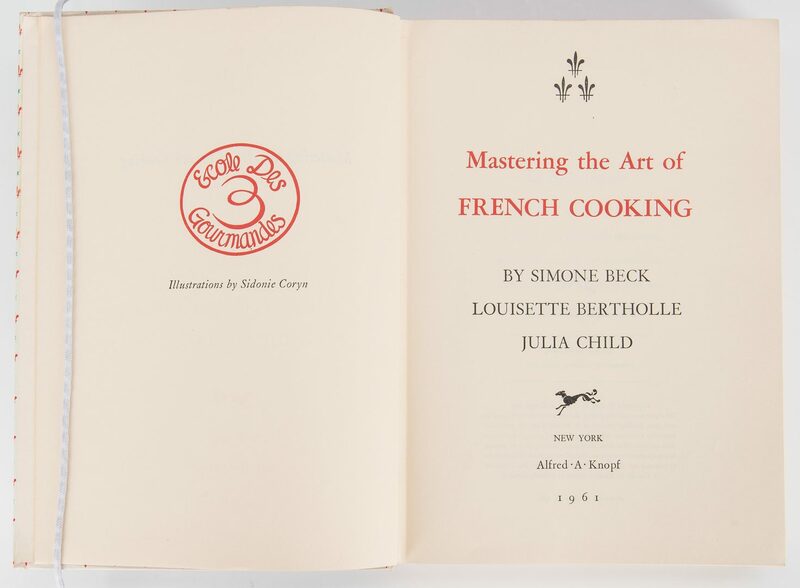 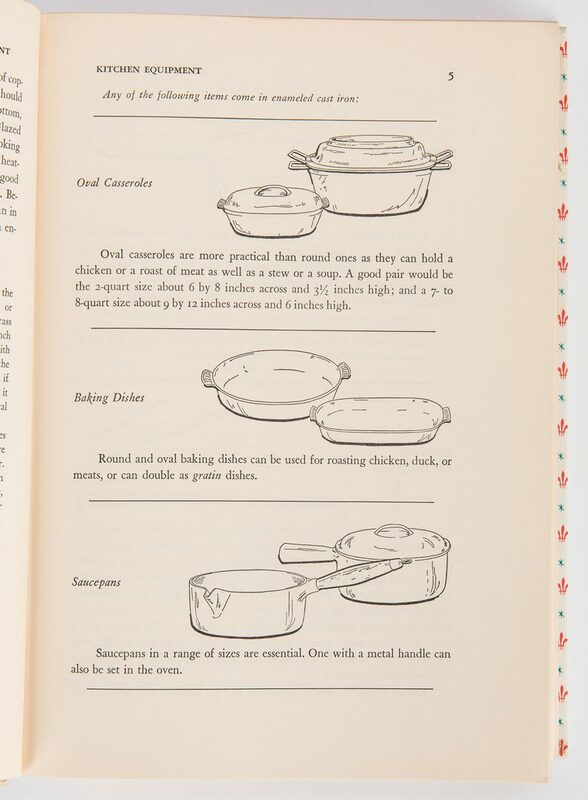 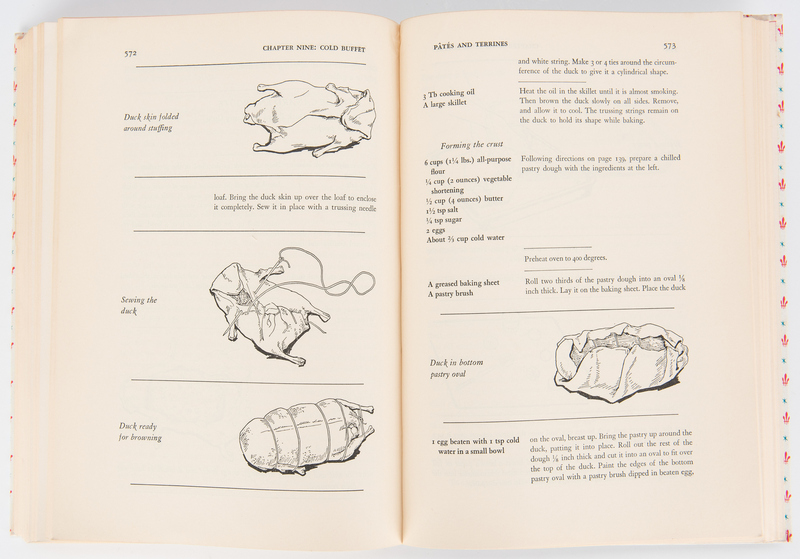 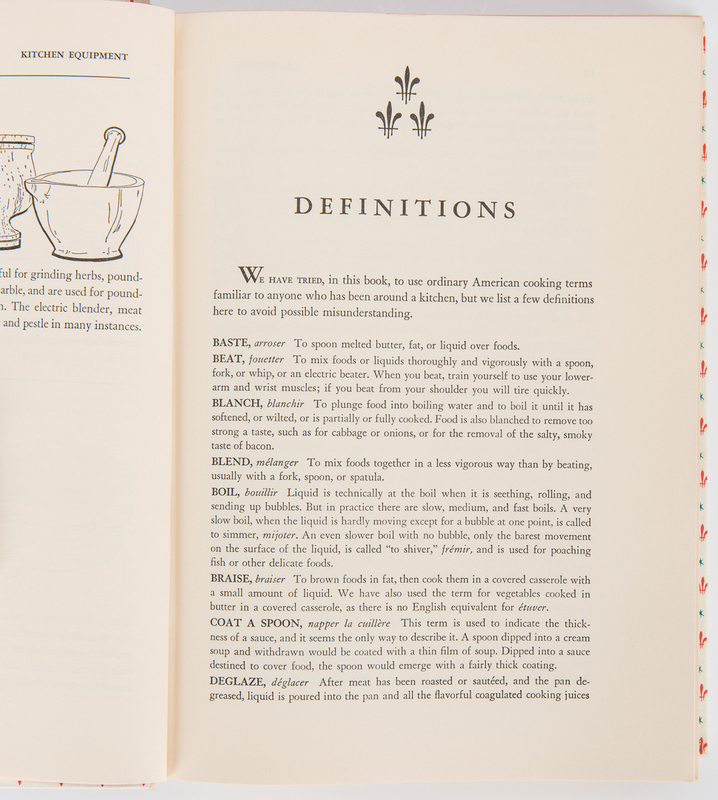 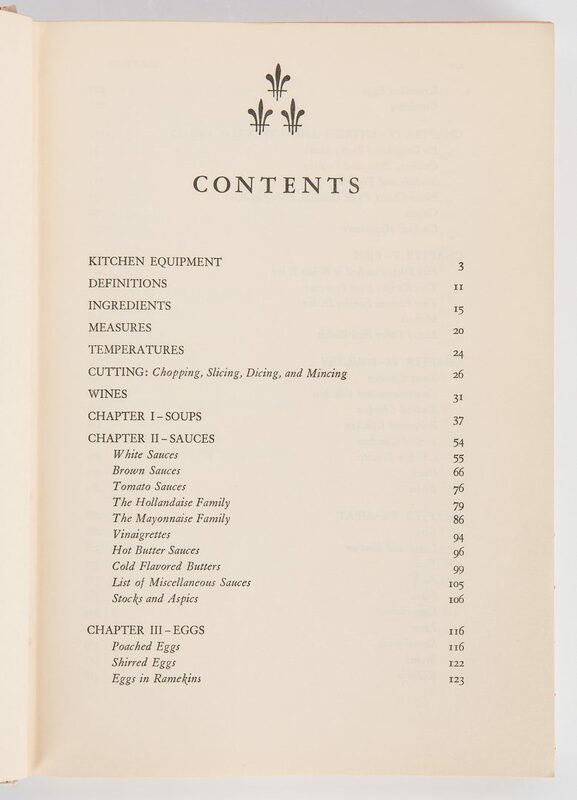 You are here: Home >> April 27, 2019 Spring Discovery Auction >> Lot 246: Mastering the Art of French Cooking, First Edition, Julia Childs, et al. 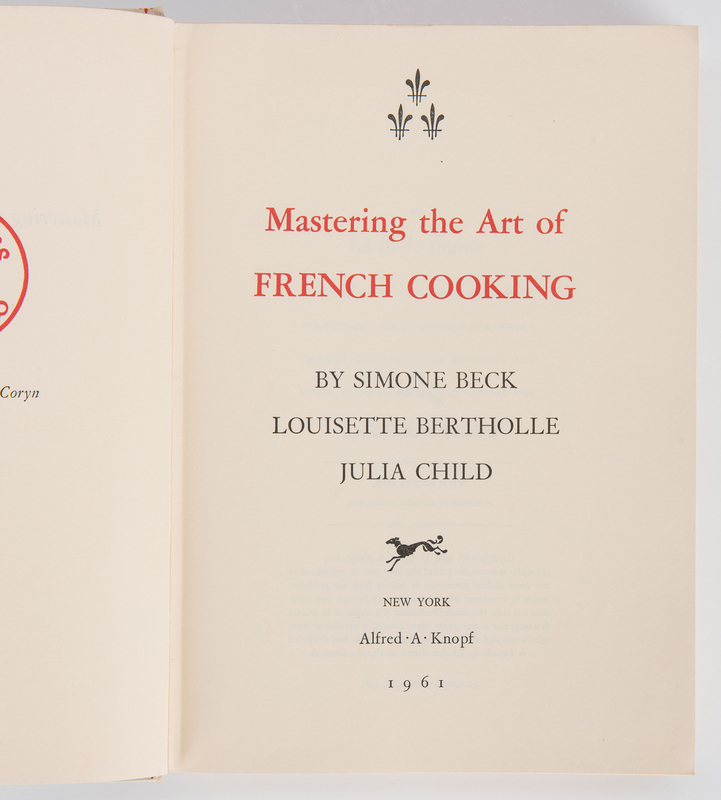 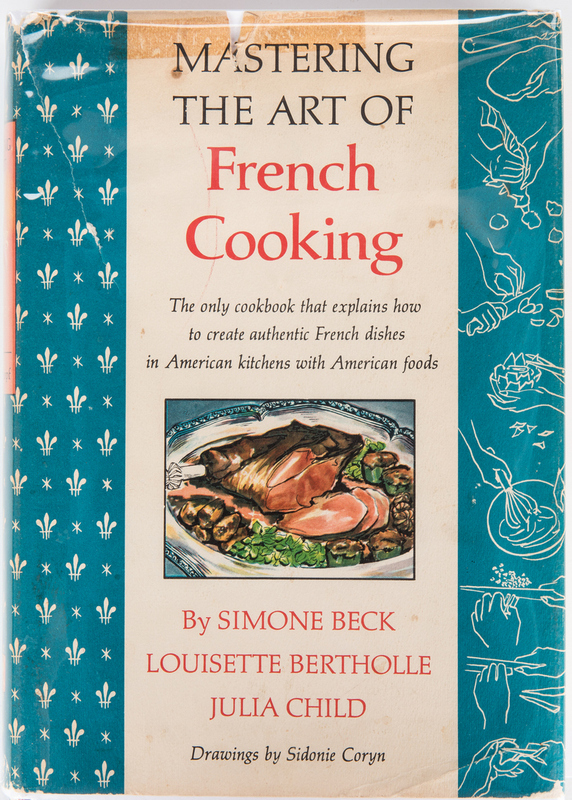 Mastering the Art of French Cooking, First Edition, Second Printing, by Simone Beck, Louisette Bertholle, and and Julia Child, illustrations by Sidonie Coryn, 1961. 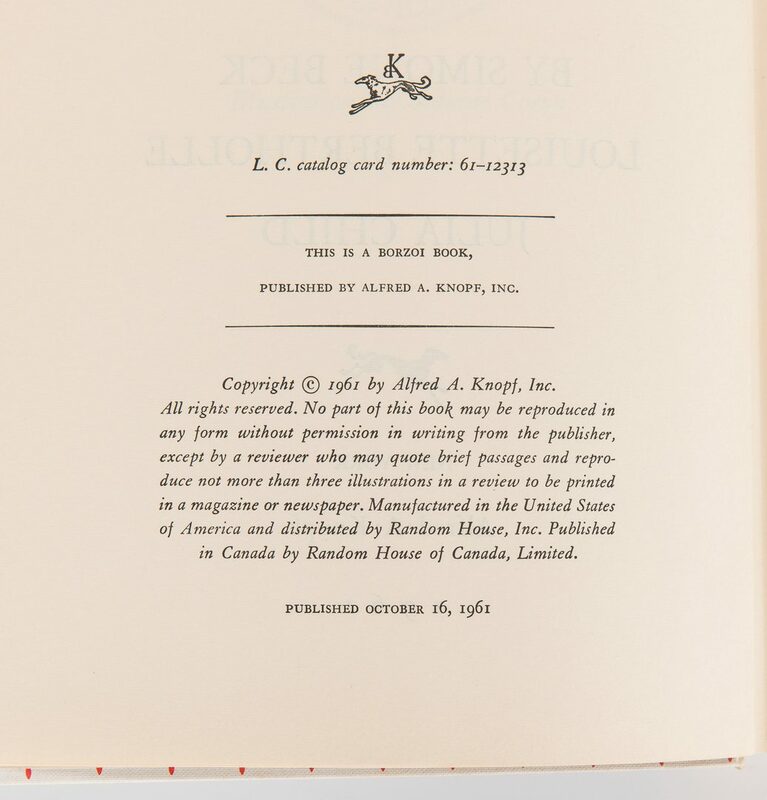 Published by Alfred A. Knopf, New York. 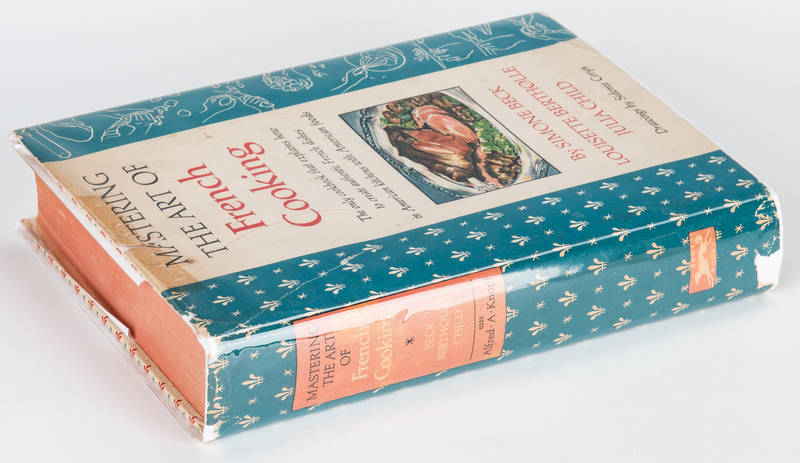 Octavo, 684 pages with illustrations, 32 page index, hardbound in white cloth with red fleur-des-lis and blue stars, title within red tile on front cover and spine, blue and white pictorial dust jacket included, red topstain. 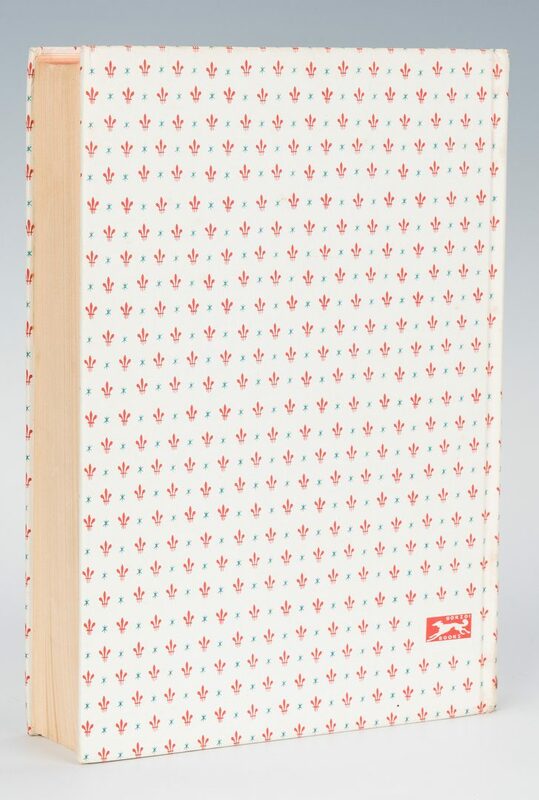 10 3/8" H x 7 1/2" W x 2 1/8" D. CONDITION: Dust jacket in overall good condition with toning, tears, largest 4", 3 3/8" area of old tape residue across top center, creases, minute stains/foxing spots, two red pencil marks, largest 1 5/8", price clipped, wrapped in a Mylar archival sleeve. 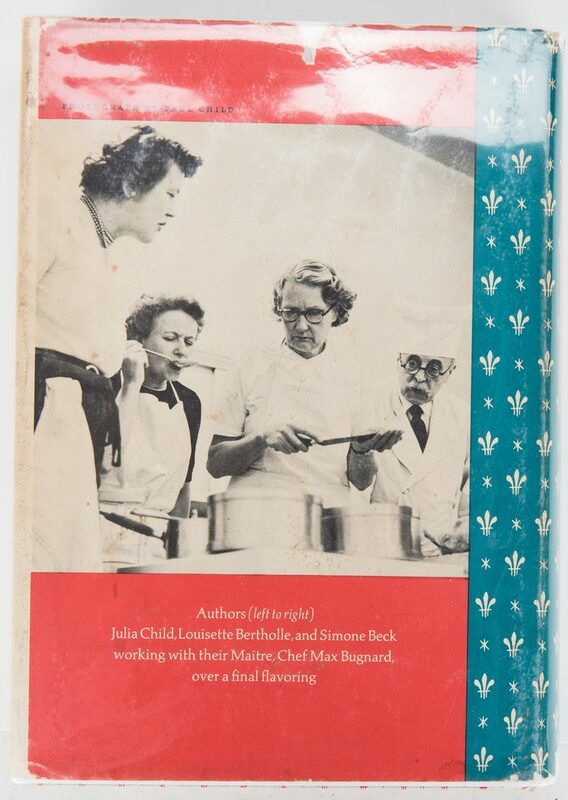 Covers in overall good condition with toning to edges, corners slightly bumped, minute foxing spots. Pages in overall good condition with light toning, crease to top left corner of most pages, binding visible between front end paper and half title page, pencil inscription top left of front end paper with minute foxing spot, minute foxing spots, back of back end paper.